aka Slapcaster Mage , looks really nice! Yeah, and overseer is honestly nearly as fast as mimic in many cases, especially if there is no HS resolved. In games where you are rushing down, it's just way better in general. 1. Green - this is actually really important. We're cutting so much green for Darksteels and Inkmoths that those last few land slots are relatively precious. 2. Mana Efficient - You don't have to pay for the graft counter, which is actually kind of huge because of how Modern be right now (Top Deck Phoenix, 2nd Deck Dredge). Oran Rief is something that isn't likely to contribute more than llanowar did to the board state by turn 4-5, which is honestly around when games are usually decided. 3. Redundancy - The time when Oran Rief is really good is when you're in top deck mode. However, the problem here is that the deck does either remarkably well in equivalent topdeck wars with decks like GB or even Grixis now, and remarkably terribly in topdeck wars against decks like UW or Prison. So it ends up being redundant or not useful where it's supposed to be great. Man discussion on HSA is pretty dead...really tempting to think it's a flash in the pan when suddenly two copies popped up in a GP top 8. Maybe not a lot of pros push it? The results don't really pair up well with the talk about the deck in any case. Anyway, can argue that overseer is better than mimic, the grindy pace of the deck doesn't match well with the velocity mimic provides and although it can have some nut plays in theory...overseer can grind out better since it can buff manlands and is a better clock. Been testing with llanowar reborn recently to see it's about. I used to be a doubter but it's a free counter that can set up busted plays and can really grind out with animation module and throne for recurring board presence. idSurge posted a message on [POLL] What cards do you want banned or unbanned in the January 21, 2019, announcement? yeah lock this up Mods. tiasian posted a message on Salvation's SCCT/OCaaT - Single Card Ideas By YOU! 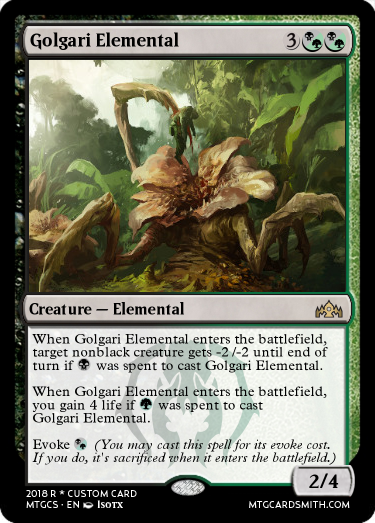 First: Undergrowth counts just Creature cards. Anyway, nice idea, reasonable cost, but I must say that I’d want to see a multi-Guild card be between two Guilds that share a color. : Add C. Put a charge counter on Mages’ Proving Grounds. , remove a charge counter from Mages’ Proving Grounds: Add R. If this mana is used to cast a red spell that deals damage to a single target, it deals that much damage plus one to that target. First game he gets me good. He counters my Living end and then swings for lethal with a Master of waves. Second game i use an anger of the gods and a ricochet trap to clear his board when he splurged it all out on the table. Then i was able to cycle freely and then cast an archfiend and then an archfiend. He then proceeded to sweep every other threat on the board. Game 3 i destroy his Aether vial, kill one of his lords with a shriekmaw and blew up a Mutavault. He still had the pressure but i had the interaction. Seeing his mana base destroyed he taped out on turn 5 and i comboed in his turn, ricochet a Spell pierce and then had lethal in my next attack phase. void_nothing posted a message on Card Idea. Evoke dependent on color of mana cast for it. Too good? Cantripmancer posted a message on Salvation's SCCT/OCaaT - Single Card Ideas By YOU! This feels fine, for the most part, very utilitarian, solid concept. It *might* even be able to be a 3/5 for that cost. You know what would be a nifty twist? When Golgari Elemental enters the battlefield, target creature gets -1/-1 for each spent to cast ~. 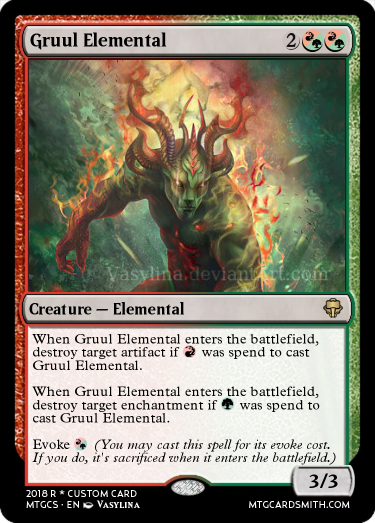 When Golgari Elemental enters the battlefield, you gain 2 life for each spent to cast ~. So the evoke is severely curtailed (maybe up the evoke cost to ? ), but the creature itself is a 2/4 that gives you up to 10 life and/or a creature gets up to -5/-5. That would be some pretty fancy Spike/Johnny candy. Heh, what's really cool (well, maybe "interesting" is a better word) is that you could make the Evoke cost (or in my alternate version) and it would be just as effective as (or ). Creatures controlled by opponents get -1/-1. At end of turn, sacrifice ~. If you do, each opponent discards a card. A moment of insanity for a lifetime of regret. That's more than fair. The body is nothing too special and downright inefficient for the cost, the effects are both worth less than one mana at sorcery speed, and even in "maximum" mode, the card is not backbreaking for its cost. You could drop to 2(B/G)(B/G) and/or make the black effect -2/-2 if you want to push the card. Else, you could add flash. This is my new deck configuration. I am going to try the Dark dwellers but i feel them to clunky. I have 20 lands because as of late i have been getting short of mana. The worst thing you can do is getting mana screw in a deck that only needs 3 lands. More lands is more appreciated and i've even considered to put a kessig wolf run for the punch. The Faerie macabre is great and you should have a full set on Main, but with that you assure yourself to have a tough matchup against Humans and Spirits. Otherwise it's a great card in all sorts of other matchups. I find it superior to Leyline in every way, since it's clunky and you can win the same amount of matchups with Faeries against graveyard based decks than without. Sideboard wise, i use Jund charms and Anger of the gods (to diversify my hate against Humans) which come great. Jund Charm is outperforming in this meta: Every time i draw it i find a relieve, in many times a game ender if the matchup stalls. If you manage to draw a brindle boar in a Burn matchup the game becomes way tougher to lose, so i think at least some lifegain is good against them.